Dawach Patrick is one of two dried up wells in Aghagower. The well is situated on the northside of the village, a few metres northwest of the enclosed graveyard. 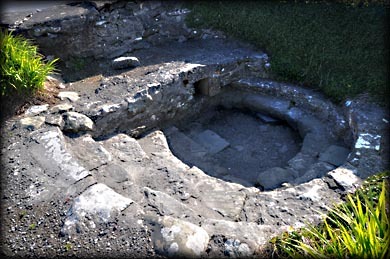 The well dates back to the time of St Patrick and is believed to be used by the saint to baptise Aghagowers first christians. 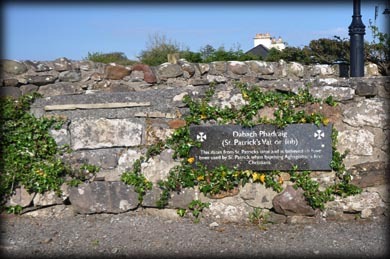 Traditionally pilgrims would stop here on the way from Ballintubber Abbey to Croagh Patrick. The pilgrims path was restored in 1987. A number of organised walks take place from Ballintubber each year. Anyone wishing to take part can get details from the Ballintubber Abbey website. I have visited the monastic site at Aghagower on several occasions, but had failed to locate the sheela-na-gig each time. Even though research pointed me to the external wall of St Patrick's Vat, I was still having no luck. After asking a local woman, who pointed the sheela out to me, I now know why it was so hard to find. The stone that bears the carving has been moved and placed on the internal side of the wall, near the information sign. 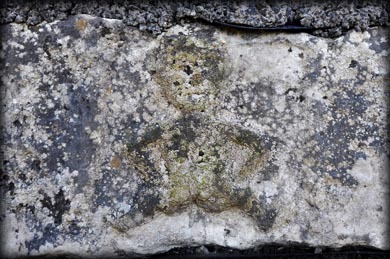 The worn figure is carved in false relief on a square background that measures only 0.15m by 0.15m. Without perfect light it is almost impossible to see the features, but I could make out the mouth, nose and eyes. I could also see the fingers and genitalia. An afternoon visit might provide a more suitable angle of light. Situated: Very easy, located in the centre of Aghagower village. Discovery Map 31: M 0339 8044. Last visit May 2017.